So I finally got around to opening all of the packages which contain the textbooks I'll need for my next grad school class, which begins Jan 23 (order early, get the best deals before my classmates!). This many packages cannot be good. Look at the fun they contain! Did the song "One of these things is not like the other, one of these things just doesn't belong?" pop into your head while looking at these? I couldn't help myself but order "K is for Knifeball" when I saw it. It is HILARIOUS. During my child care unit my students analyze various children's books, and I've been looking for a couple of books to slip in that are definitely not appropriate but look like books for kids (and I'm thinking slipping in "Go the F**k to Sleep" would probably get me fired) - this is perfect! And, an enjoyable read all on its own, of course. And now that I'm scrolling through my blog, I don't think I've mentioned grad school at all. 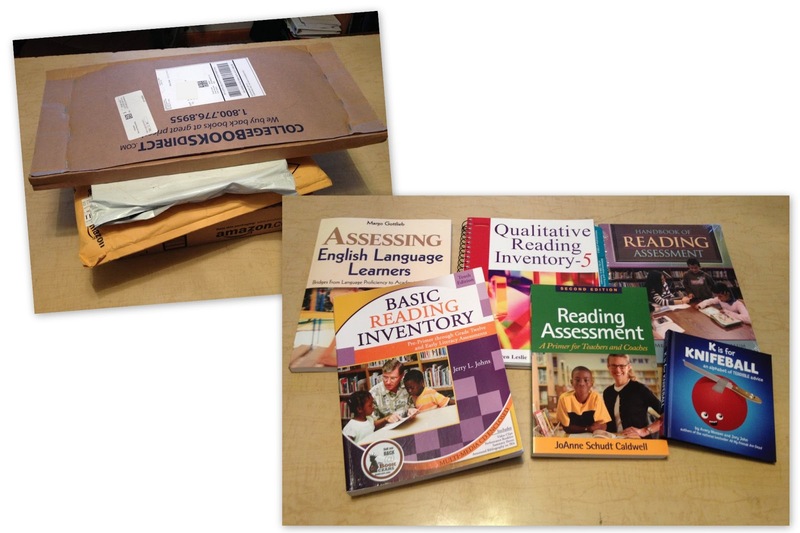 In September I went back to school for a Reading Specialist master's. I don't know what if any career changes that may lead to in the future, but what I'm learning has already made me a better teacher! It has always driven me crazy when high school/middle school content teachers pronounce "Well I'm not a reading teacher." Bull, we're all reading teachers! The number of strategies to help kids with their reading (and let's face it, no matter what you teach or what age you teach, you have got a LOT of kids who struggle with basic reading!) I've already learned is staggering, and I've implemented quite a few of them with great returns so far. I keep thinking "If only I had known this x years ago!" The only problem with taking on a Reading degree is that it leaves you much less time for your own reading! I managed to get in some of the reading I wanted to do over break, but not what I aspired to (isn't that always the case with breaks?). One of the great ironies of being a teacher is that most of us love to read and most of us don't have anywhere close to the amount of time we need for such pursuits!